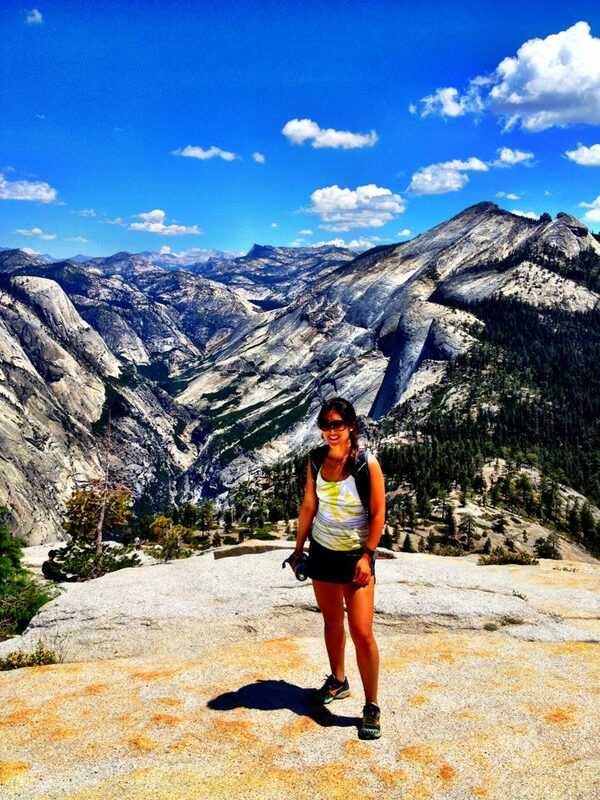 Over 4th of July weekend, we headed to Yosemite to climb the famous Half Dome. 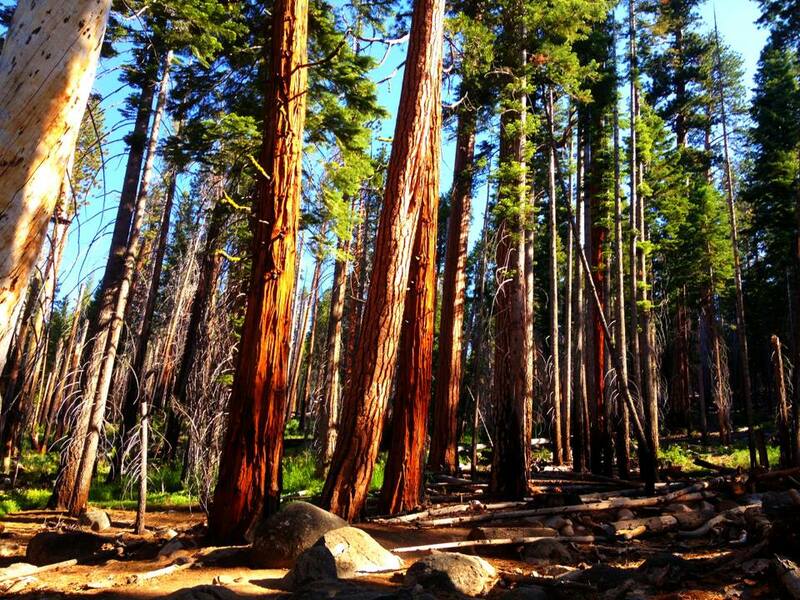 It wasn’t until the week of our trip that we started contemplating the idea of doing this hike. Everyone now needs a permit to climb the ropes and summit the peak, which is difficult if you didn’t reserve a permit far out in advance. Without a permit, you can hike only as far as the base of subdome, which is where a series of switchbacks begin about a quarter mile before the base of the cables. Luckily they are doing a daily lottery now where if you apply 2 days before the day you want to go, you are entered in the daily lottery. I knew our chances were slim of getting in since it was a long weekend and hundreds of people apply everyday. At midnight the night before we left, we lucked out and got confirmation that we were in, so we started scrambling around the house trying to pack for this 10+ hour hike. With the weather forecast in the 90’s we knew we need to bring A LOT of water since there would be no water stops along the way, except the first mile in. 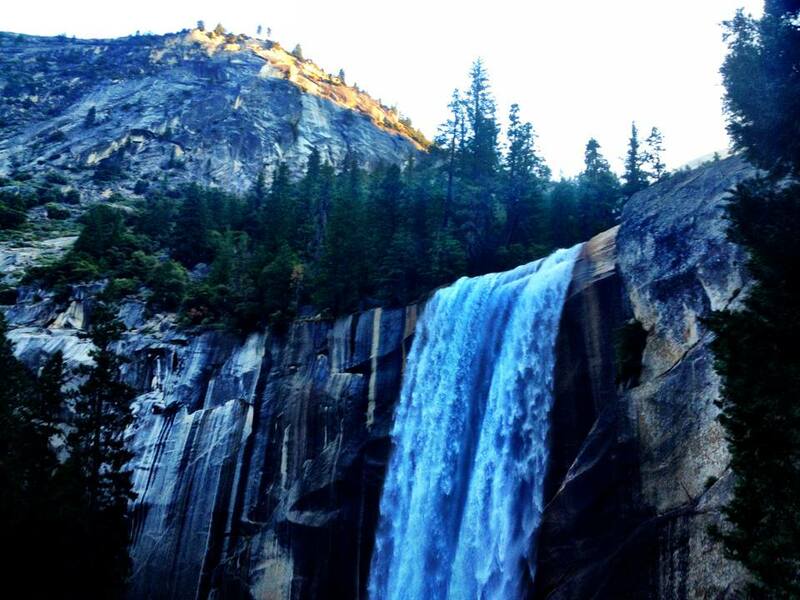 The hike itself is listed as 14 miles roundtrip via Mist trail and 16.5 via John Muir trail, but we somehow ended up with 20 miles for the day starting at Camp Curry Village and all the walking around we did at the top of Half Dome. The cables usually go up in May and come down October, so climbing Half Dome (safely with the cables) is only a possibility during this period. 4 Liters of water per person (we carried a mixture of water, powdered coconut water (found these at REI) and Gatorade. We definitely could of used more especially the last 2-3 miles. Our hike started at 5AM so we could get most of our uphill hiking done before the sun really starting beating down and to avoid the crowds. I brought a headlamp but didn’t really need it as it was already getting light out. We filled up our camelbaks and water bottles at Happy Isles where the trail starts and made our way onto the trail. I was worried about not finding our way to Half Dome, but everything was well marked and you just kept following the signs towards Half Dome. A mile in is the last water stop and they even have a sign telling you to fill up now because there won’t be anything in between, unless you have a filter and want to drink from the stream, but I don’t think that is advised. I was surprised at how quickly the trail turned into a gradual uphill hike and not used to carrying so much on my back, it was definitely a workout right from the get-go! 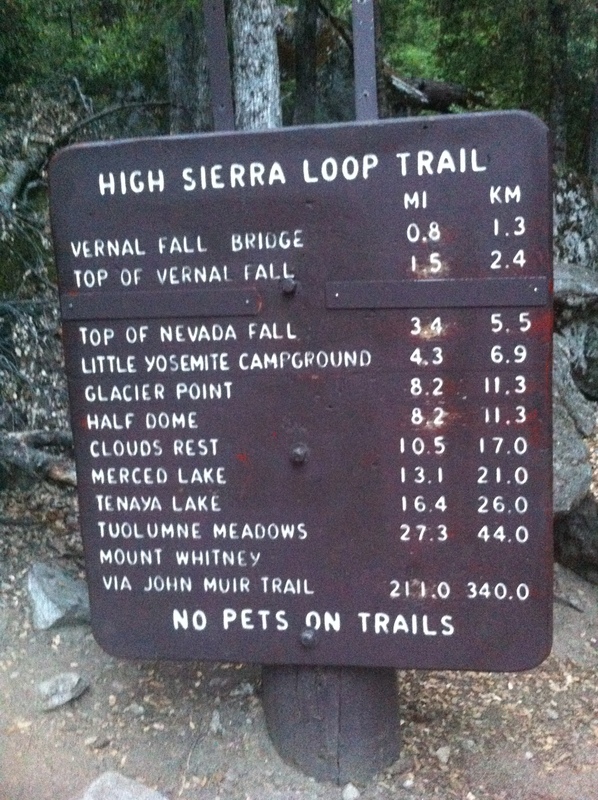 We decided to take the Mist Trail as opposed to the John Muir Trail even though it’s a lot steeper but shorter in length. We were not disappointed. Boy those steps were so steep and slippery from all the mist. 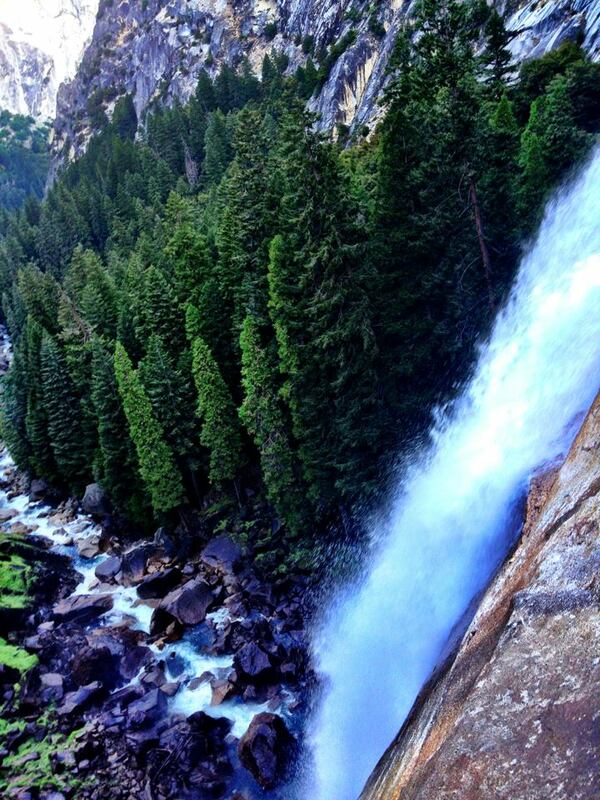 After the steep ascent up the Mist Trail, we arrived at the top of the 317 ft Vernal Falls. They have railings to guard people from going in the water and possibly being swept over. Past the huge waterfall is the Emerald Pool, which is a large bulge in the river with an inviting, but deadly area that may seem like a fun place to swim, but is prohibited due to the cold water, the current and the proximity to the fall just around the corner. Though we did see a group swimming back and forth in the pool? 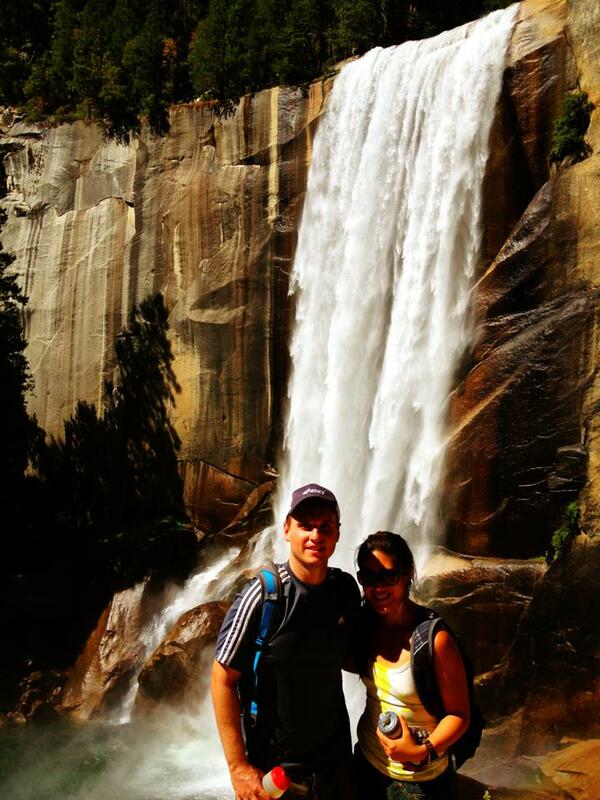 As we transitioned from a dirt trail and began to hike up granite slabs, we started our hike up to Nevada Fall where we got a great view of the 594 foot waterfall. 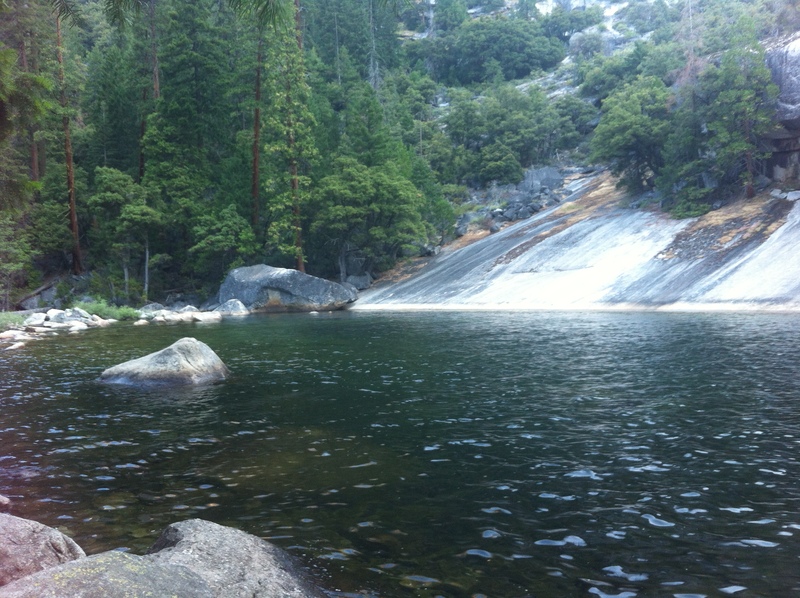 After a long haul up, the trail came to a “T” with the John Muir Trail which is recommended to take on the way back since it is less steep and less crowded. We finally hit some level ground hiking into Little Yosemite Valley where the Merced river flowed to the right and we got out first glimpse of the backside of Half Dome in the distance, though you couldn’t see the cables. After a mile of leveled ground, we started our gradual switchbacks up the trail again. While ascending this forested area, we were lucky enough to see a few mule deers. The switchbacks seemed to go on forever as it was a relentless climb up to the base of sub dome. The trail wasn’t as steep as the Mist trail, but it was just the constant persistent uphill that made this part of the hike particularly challenging, especially since there was no cover overhead and it was almost noon. We took a few rest breaks wherever we could find shade and a rock to sit on. As we headed towards sub dome, the trees got thinner and the views open up. At the base, there was a ranger checking for permits before you could make the ascent towards the top. 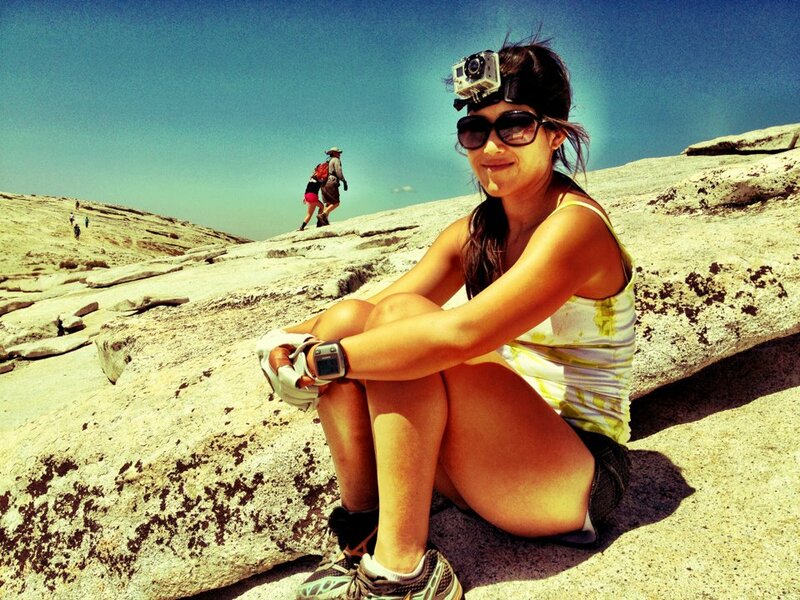 Sub dome is a 400 ft rise up a carved switchback granite staircase. I actually found this more challenging than climbing the cables itself. 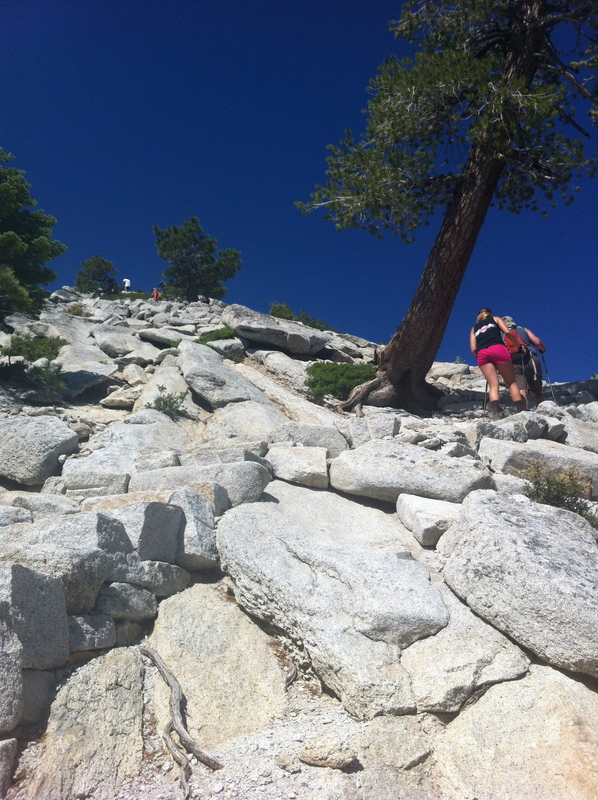 The staircase lies above the tree line and is very strenuous. 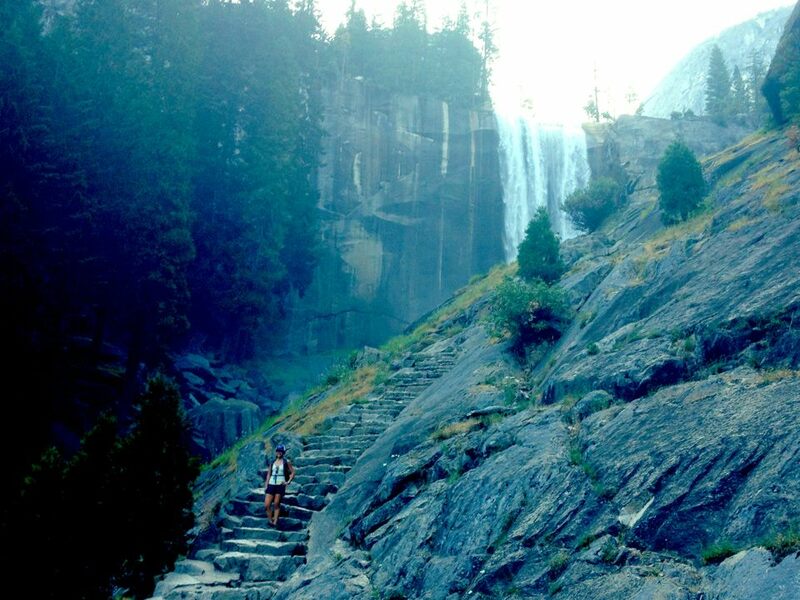 I can see how hiking poles would be really helpful here to help stabilize you on these steps. Luckily we were still fairly early when we got here so we didn’t have to move out of the way too much for those that were descending. 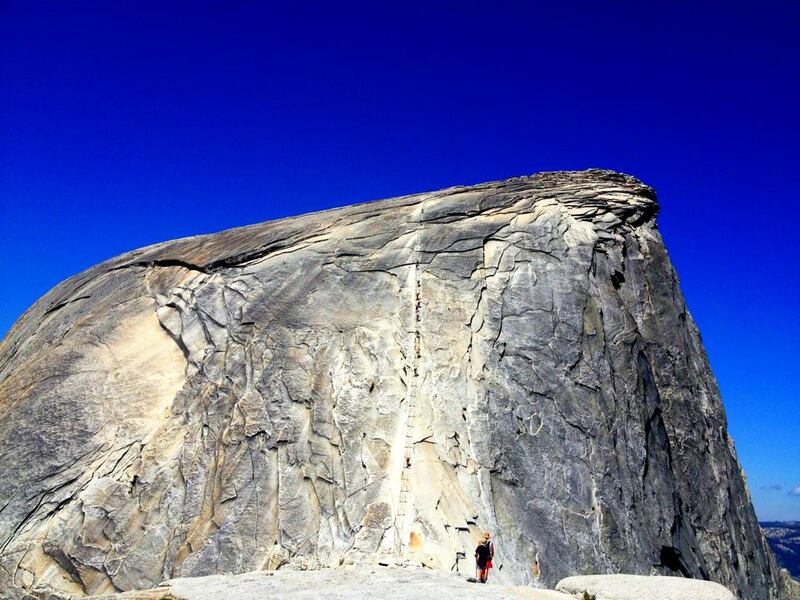 You can also start to see the cables going up Half Dome. When we finally arrived at the top of Sub Dome, we came face-to-face with the infamous cables. Pictures from what I’ve seen online do little to convey just how massive the climb is. The people on the cables looked like little ants ascending a vertical wall. We stopped here for a little bit, got our gear together before making our way to the cables. We decided to dump our packs here so we wouldn’t have to carry the extra weight while climbing. It would have been nice to have some water at the top, but climbing the cables without all that weight was worth it. Once we got to the cables, we stayed on the right side to let other descend on the left. Though sometimes, people end up gripping both cables so you had to get out of the way while still holding onto one cable. It was nice to not have the cables crowded because we weren’t stuck behind people while going up. I used the single cable rappel method which I found a lot easier than trying to hold onto both cables. There are wooden boards set into the granite which acted like a resting point where you could stand steady for a little bit. There are poles on both sides, but they are merely resting in holes so they come out if you pull up. Surprisingly, the climb wasn’t as hard as I expected. It definitely looked steeper from afar but wasn’t too bad once you were actually on the cables. I thought I would freak out being so high up, but I just kept focused on the next board ahead of me and steadily climbed to the top. 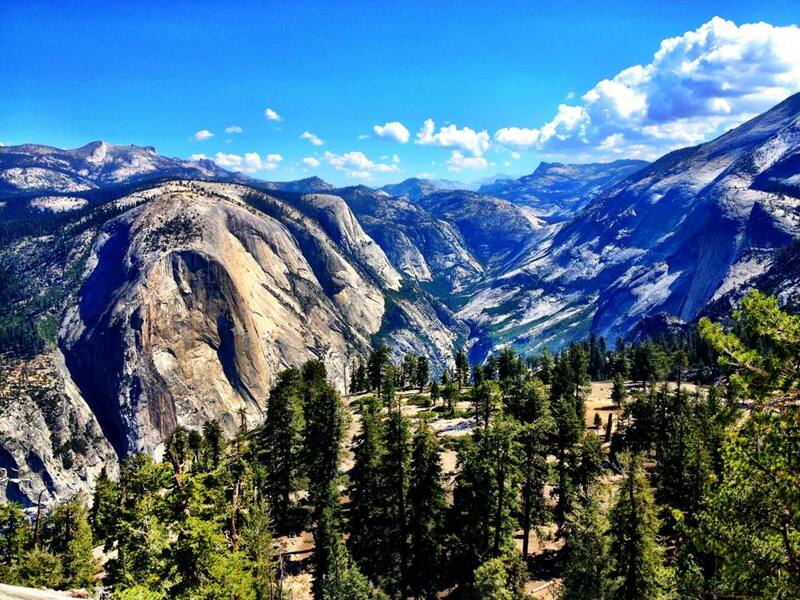 Once at the top, there are many view points to see, such as Cloud’s Rest, Glacier Point and El Capitan. I walked around the top for a bit, saw a few people taking pictures on the famous ‘diving board’ which is a rock ledge that juts out and caught a couple hats flying off on the camera. We didn’t spend too long at the top for fear of the cables getting more and more crowded while descending. 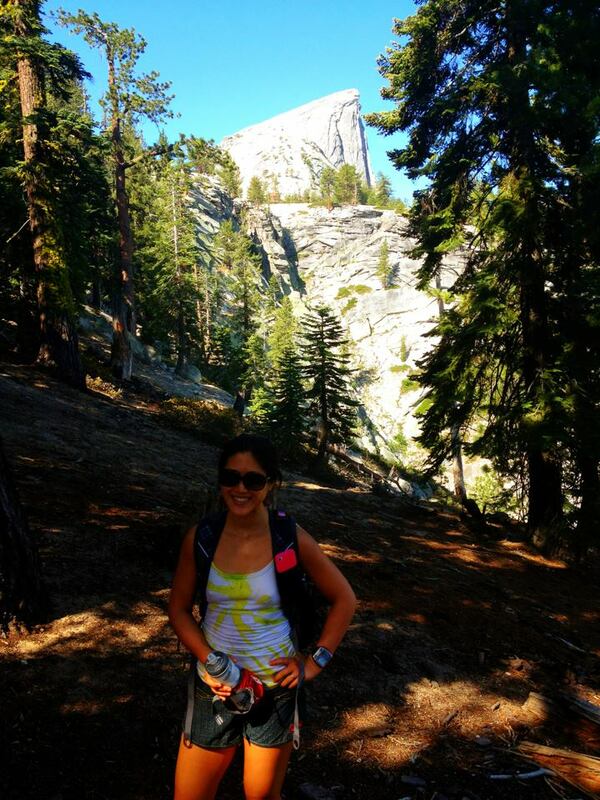 I started the descent facing downhill, but found facing backwards and repelling down to be a lot easier. Unfortunately we were stuck behind a couple who were taking a really long time going down. Heading down was a blast as I just let my cable slide on my gloves and my shoes glide me down the mountain. It got a tricky when people were ascending as you had to move out of the way or let them come up first. At some point, we got stuck in the middle of a couple fighting. The woman wanted to go back down but the guy kept trying to push her back up. Finally at the base, we took a short rest break before heading down sub dome, which might be scarier than going up and retracing our steps all the way back to the village. It got a lot more crowded on the trail close to the trailhead, especially near Vernal Falls and on the Mist Trail since this is only a 2-3 mile hike from the trailhead and a popular spot for tourist who don’t want to go as far. 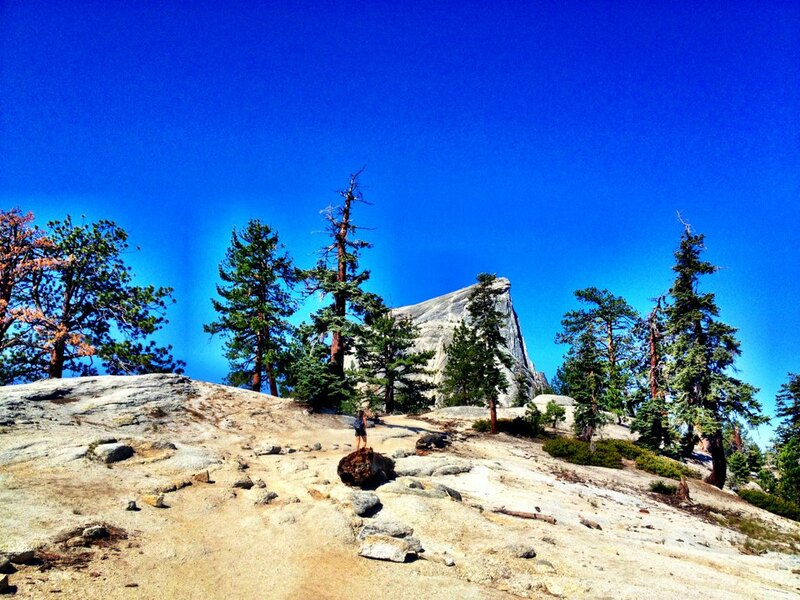 We ended up hiking 20 miles in a little over 10 hours which is not too bad considering the breaks we took and the time we spent up at the top of Half Dome. It was a great day on the trails and a nice warm-up for all our adventures ahead in Iceland. So glad to be able to check this hike off my bucket list and I can’t wait to come back someday and do it again.